7 Korean version of expanded CDR CDR 0 CDR 0.5 CDR 1 CDR 2 CDR 3 CDR 4 CDR 5 기억력 Memory 기억장애가전혀없거나경미한건망증이때때로나타남. 경하지만지속적인건망증 ; 사건의부분적인회상만가능 ; 양성건망증 중등도의기억장애 ; 최근것에대한기억장애가더심함 ; 일상생활에지장이있음 심한기억장애 ; 과거에반복적으로많이학습한것만기억 ; 새로운정보는금방잊음. 심한기억장애 ; 부분적이고단편적인사실만보존됨. 부분적인사실조차도보통잊어버림. 난해하거나부적절한말을사용하기때문에기억력을검사하기힘든경우가잦음. 의미있는기억기능이전혀없음. 이해력이없거나둔한경우가잦음. 지남력 Orientation 정상 시간에대한경미한장애가있는것외에는정상 시간에대해중등도의장애가있음 ; 사람과장소에대해서검사상으로는정상이나실생활에서길찾기에장애가있을수있음 시간에대한지남력은상실되어있고장소에대한지남력역시자주손상됨. 사람에대한지남력만유지되고있음. 자신의이름에대해서만때때로반응함 자신에대한인식이전혀없음. 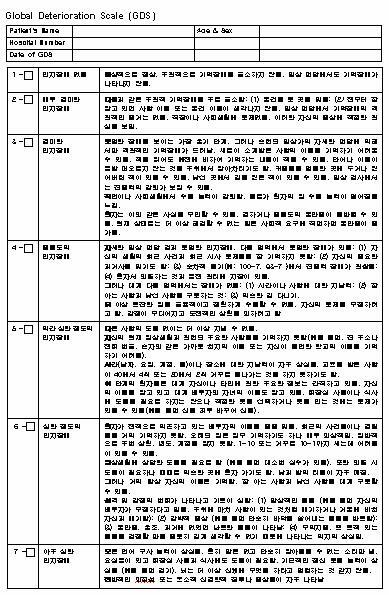 판단력과문제해결능력 Judgment and Problem solving 일상생활의문제를잘해결하고사업이나재정문제도잘처리함 ; 과거에비해판단력은아직좋음 문제해결능력, 유사성, 상이성해석에대한경미한장애 문제해결능력, 유사성, 상이성해석에대한중등도의장애 ; 사회생활에대한판단력은대부분유지되어있음. 문제해결, 유사성, 상이성해석에심한장애 ; 사회생활에서의판단력이대부분손상됨. 판단이나문제해결이불가능함. 단순한지시나명령에대해서도수행할능력이없음. 문제에대한인식이나주변환경에대한이해가전혀없음. 사회활동 Community Affairs 직장생활, 물건사기, 자원봉사, 사회적활동등에서보통수준의독립적기능이가능함. 이와같은활동에있어서의장애가의심되거나약간의장애가있음. 이와같은활동의일부에아직참여하고있고언뜻보기에는정상활동을수행하는것처럼보이나사실상독립적인수행이불가능함. 집밖에서독립적인활동을할수없으나외견상으로는집밖에서도기능을잘할수있어보임. 집밖에서독립적인활동을할수없고외견상으로도가정을떠나외부에서는정상적인기능을할수없어보임. 어떠한사회적상황에서도의미있는참여를할수없음. 어떠한활동에도참여할수없음. 집안생활과취미 Home and Hobbies 집안생활, 취미생활, 지적인관심이잘유지되어있음. 집안생활, 취미생활, 지적인관심이다소손상되어있음. 집안생활에경하지만분명한장애가있고, 어려운집안일은포기된상태임. 복잡한취미나흥미 ( 예를들어바둑 ) 는포기됨 아주간단한집안일만할수있고, 관심이나흥미가매우제한됨. 집안에서의미있는기능수행이없음. 어떠한취미활동이나집안일에도의미있는참여를할수없음. 어떠한활동에도전혀참여할수없음. 위생및몸치장 Personal Care 정상 정상 가끔개인위생에대한권고가필요함. 옷입기, 개인위생, 개인소지품의유지에도움이필요함. 개인위생과몸치장의유지에많은도움이필요하며, 자주대소변의실금이있음. 옷입기나식사를하려는시도는있음. 도움없이는이동하지못함. 식사시먹여주어야함. 누워지내는상태임. 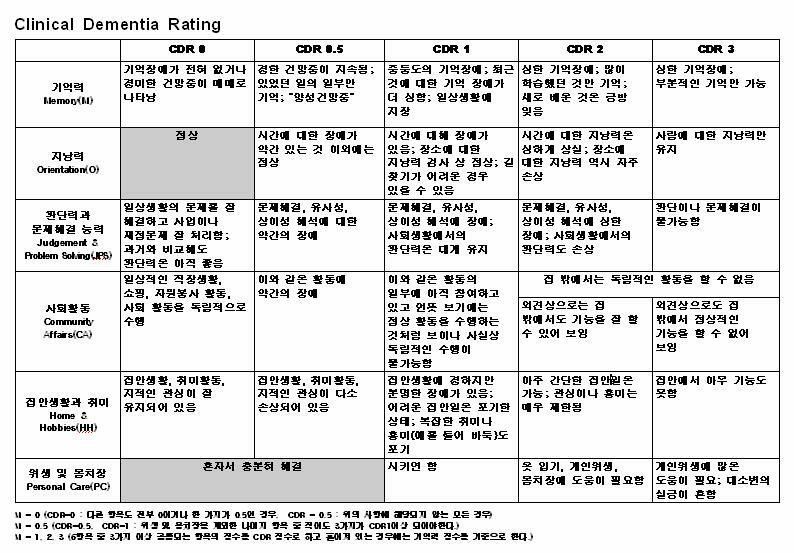 11 CDR Rating Worksheet Clinical Dementia Rating Worksheet This is a semi-structured interview. Please ask all of these questions. Ask any additional questions necessary to determine the subject s CDR. Please note information from the additional questions. Memory Questions for Informant: 1. Does he/she have a problem with his/her memory or thinking? Yes ( ) No ( ) 1a. If yes, is this a consistent problem (as opposed to inconsistent)? Yes ( ) No ( ) 2. Can he/she recall recent events? Usually( ) Sometimes( ) Rarely( ) 3. Can he/she remember a short list of items (shopping)? Usually Sometimes Rarely 4. Has there been some decline in memory during the past year? Yes( ) No( ) 5. Is his/her memory impaired to such a degree that it would have interfered with his/her activities of daily life a few years ago (or pre-retirement activities)? (collateral sources opinion) Yes ( ) No ( ) 6. Does he/she completely forget a major event (e.g., trip, party, family wedding) within a few weeks of the event? Usually( ) Sometimes( ) Rarely( ) 7. Does he/she forget pertinent details of the major event? Usually ( ) Sometimes ( ) Rarely ( ) 8. Does he/she completely forget important information of the distant past (e.g., birthdate, wedding date, place of employment)? Usually ( ) Sometimes ( ) Rarely ( ) 9. Tell me about some recent event in his/her life that he/she should remember. (For later testing, obtain details such as location of the event, time of day, participants, how long the event was, when it ended and how the subject or other participants got there). Within 1 week: Within 1 month: 10. When was he/she born? 11. Where was he/she born? 12. What was the last school he/she attended? Name Place Grade 13. What was his/her main occupation/job (or spouse s job if subject was not employed)? 14. What was his/her last major job (or spouse s job if subject was not employed? 15. When did he/she (or spouse) retire and why?